What is the difference between item name and SKU in QuickBooks Online? Amazon uses a SKU as a unique label to identify products. That means every single product has its own unique SKU. QuickBooks Online works a little differently. When you create a new inventory item in QuickBooks Online, the Name is unique. However, inventory in QuickBooks Online can share the same SKU. When you use SellerZen, you have the option of mapping your Amazon SKU to either the QuickBooks Online Inventory Name or SKU. We recommend you map Amazon's unique SKU field to QuickBooks Online's unique Name field to reduce any inventory confusion. If you use our Setup Wizard, we'll map your unique Amazon SKU to QuickBooks Online's unique Item Name field. For the QuickBooks SKU field, we'll use the ASIN. If you map your Amazon SKU to the QuickBooks SKU field, then we'll use the Amazon SKU for both the QuickBooks SKU field and the Name field. 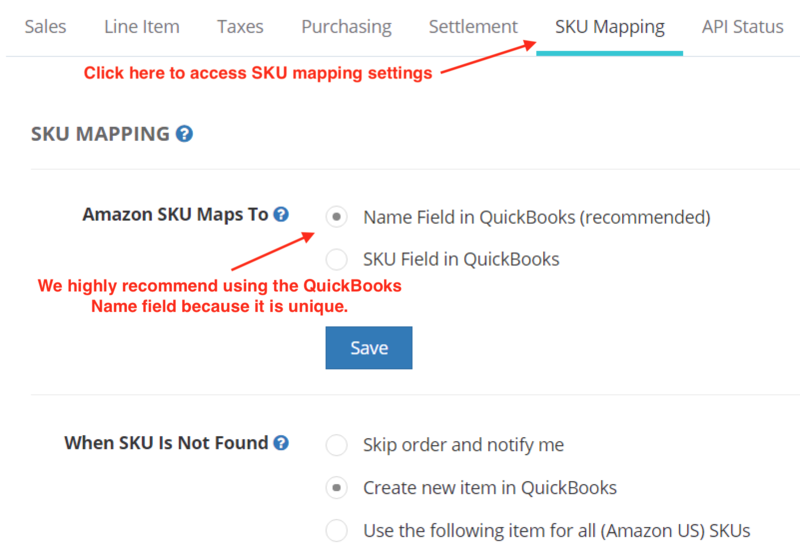 You can change how SellerZen maps Amazon's SKU to QuickBooks Online in the Integration > SKU Mapping tab.